Would it be possible that the Bubble Calendar limits its search to the current view (current day, week or month). Our clients use the calendar to view employees time-sheets and it is currently taking more than 20 seconds to load the view because it tries to search through the entire database of records to simply check the current week data. I could limit the search of the records to the current week, but the calendar provides no feedback regarding when the users scrolls to previous weeks/months, so I cannot dynamically change the searched data and we am forced to look at the entire database. Any way this could be implemented by either limiting the search to the start and end dates inside the actual calendar view or, alternatively, provide an action of when the user changes the dates and what are the actual dates visible. Additionally, a action that triggers when an element has been resized would be very useful. Would be good if the system could recognize the current month/week being viewed to limit Search queries. I actually just had to change my calendar setup in my main app last week because of this exact reason. Thanks for the input. I did try this approach in the past, but my clients want a weekly view and that’s almost impossible just using repeating groups. I just seems such an easy fix (I guess) that it is a pity not to have it. @starnapp We added a feature that allows you to refer to calendar’s current date range which is what the app user is seeing. 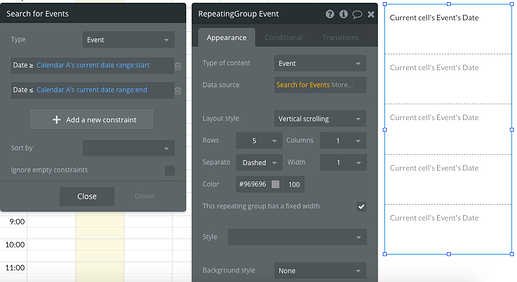 You can add :start and :end of the date range as constraints in an repeating group. @neerja this is great! Thank you very much for this quick turnaround! Much appreciated.